The transition from the “Oughts” to the 2010’s was one that meant moving away from the paranoia caused by 9/11 and the emergence of the Iraq War. Movies like The Dark Knight and The Hurt Locker were very much part of cinematic zeitgeist and, not unlike most decades, world issues bled into art on and off screen. Times are tough now for the blockbuster, as you see the transfer of power from two or three blockbusters a summer to 12 potential blockbusters with related cinematic universes waiting. Movies like Avatar and Iron Man were major signs of what was to come for theater goers, and we can still feel the reverberations now. What this list reflects on are the most challenging and radical shifts that our current decade has offered the world of cinema. Cinema has always had a way of making societal commentary slip into our lives like medicine for a puppy. Some of the films on this list aren’t quite that secretive - but I’m willing to let that slide. One of the stipulations of this list is that there can only be one film per director (sorry, we can’t mention every movie by Denis Villenueve). With that in mind, here is my list. Richard Linklater has made a career off of not doing things flashy. He has a introspective way of presenting his stories to viewers in a way that makes us feel as though these are our memories. Rarely is there a movie that takes 20 years to make and in that time span seems as though there weren’t any issues to overcome. Everything about this movie is about growing up through the 2000’s and much like “Mason” we get to relive our memories of the 2000s along with him. The moment he leaves for college makes you realize that it’s time for us to leave this decade in the past and hope for a new age for us all. With a great soundtrack and great performances by everyone all around, Boyhood wasn’t just a film that was a high concept piece of art brought to life. It was a film that every director would hope to accomplish in terms of making a story about life and all the trials that come with it. It’s hard to have a film like Moonlight come to do what it did - and accomplish it with flying colors. Barry Jenkins created a story that transcends its superficial content of a boy becoming a man who doesn’t feel comfortable in his own skin. Moonlight is one of the most heartfelt Oscar award-winners of the decade, and the next best film is a distant second. A three part story about the same character with different names, Little, Chiron and Black; each part of the story is beautiful and important for its own reason. Moonlight tackles many issues that are not only taboo within one community, but strangely difficult to discuss at all in America. The most impressive part of the film is that it’s Barry Jenkins' first full length film, and I hope that it’s the first of many more to come from this truly interesting director. To be honest, nothing about this movie should have worked on paper. It’s a sequel from over twenty years ago, kind of a reboot and replaces an iconic actor in a role of a beloved franchise - via Tom Hardy in lieu of Mel Gibson. George Miller’s hard work brought his creation back to life in the most rewatchable way possible. Fury Road ditches the “B film” quality that gives its predecessors such an endearing feel in favor for a much more epic, blockbuster take on the dystopian genre. The film is less about Max and more a story of female lead Furiosa, who is the coolest hero this decade. For a film set in the desert, it’s beaming with comic book colors and personalities. Fury Road will most likely go down as the most successful reboot of a franchise of the decade and we welcome back Max. Nicolas Winding Refn isn’t a popular director, and he wasn’t known for making cool movies. Ryan Gosling was still known as “the guy from The Notebook” and wasn’t the suave guy that we know him as now. However, when the two came together to do a throwback action film about a Hollywood stuntman moonlighting as a getaway driver, film magic was made. They created art that is now a popular action film template. It wasn’t the story that captivated everyone, but the style in which it was done. Fresh off the EDM era, Kavinsky provided the song “Nightcall” at the beginning of the film and from there on out it’s electronic music, fast cars and violence. Sorry John Wick, Drive had your style first - but there’s room to love both, I suppose. 2014 will go down as the year that the we were introduced to Damien Chazelle “the director”. Whiplash is the story that made jazz really cool in a decade that has yet to make an effort to keep it alive. There is an obvious love of music that shines in this film and within its director. 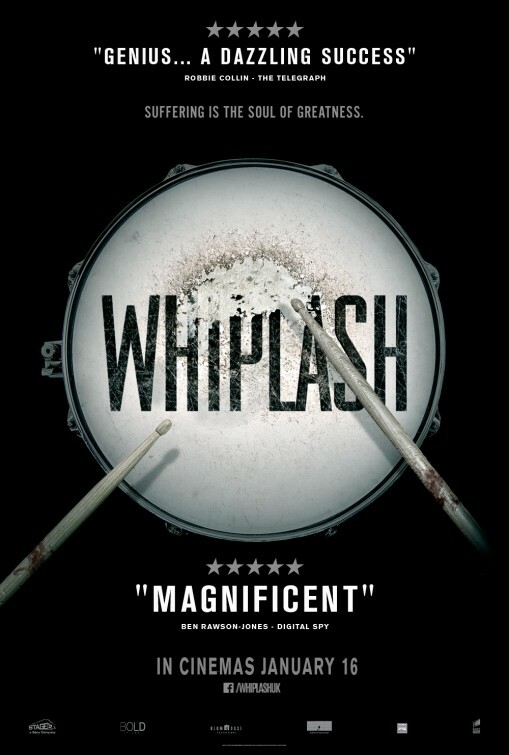 Whiplash has a strength and coolness in its music and history. The story intrigues viewers who might not have been aware of jazz and after watching this film, will go check out what they’ve been missing. J.K. Simmons earned his first Oscar and, judging from his choices after this film, was the best role Miles Teller will ever take. Even if it was a peak for everyone involved, what a great way to peak.